Nellie Tayloe Ross was the 14th governor of Wyoming, serving from January 5, 1925 to January 3, 1927. She was elected to complete the term of her husband, William Bradford Ross, who died in office. In 1933, President Franklin D. Roosevelt appointed her the first woman to head the U.S. Mint, a position she held until 1953. Nellie Davis Tayloe was born in 1876 in St. Joseph, Missouri. Her family moved to Omaha, Nebraska where she completed a two-year program to become a kindergarten teacher and taught briefly. While visiting relatives in Tennessee, she met William Bradford Ross, a young lawyer. They were married in 1902 and lived in Cheyenne, Wyoming. The Rosses had four sons. 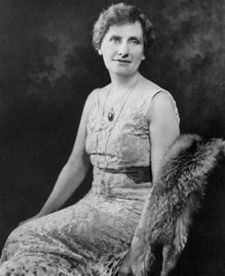 While Nellie devoted herself to her home and family, William practiced law, occasionally ran for political office and eventually was elected governor in 1922. In October 1924 he died of complications from an appendectomy. Because his death occurred so close to a general election in November, Wyoming law required that his successor be elected then. Democratic Party leaders nominated Nellie. She ran against Republican Eugene J. Sullivan of Casper and won the election. One advantage Nellie was seen to have was the desire of the citizens of Wyoming to be the first to elect a woman governor, after having been the first state to grant women the right to vote in 1869. Nellie was nominated by the Democrats for reelection in 1926 but was defeated in a close race by the Republican candidate, Frank C. Emerson. Following her governorship, Nellie served as a Wyoming committeewoman to the Democratic National Committee and then as vice chairman of the DNC, in charge of activities for women. In 1933, President Franklin D. Roosevelt appointed her director of the U.S. Mint. She held this position until 1953. Nellie died in 1977 in Washington, D.C. at the age of 101. John A. Campbell, Wyoming's first Territorial Governor, signed a bill on December 10, 1869 making Wyoming the first state to grant women the right to vote. In 1870, Martha Symons-Boies-Atkinson of Albany County was appointed the first woman bailiff in the world. Estelle Reel Meyer was elected as Superintendent of Public Instruction in 1894.